SideSwiper Net -- SSN: G0GSY's keys. 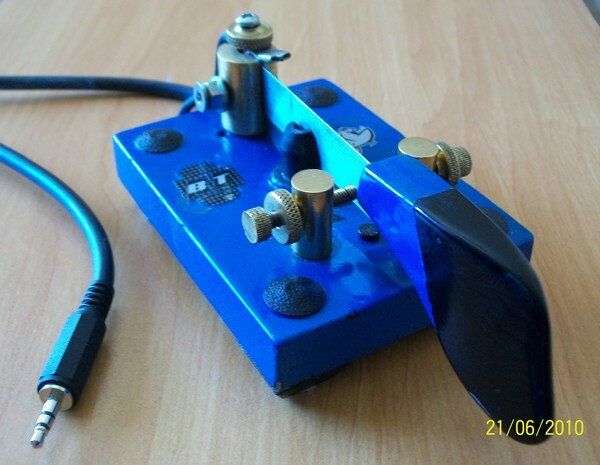 Magnetic Key made by M0BZU. The base is made of steel from an old Kent key, the blade is a stainless steel ruler with a small rubber in the middle to stop excess vibration, the handle is wood off an old LTA key I didn't get on with, I then decided to spray it Harbour Blue and add a tint of black to the handle. This key works very well and is a pleasure to use giving lots of satisfaction. 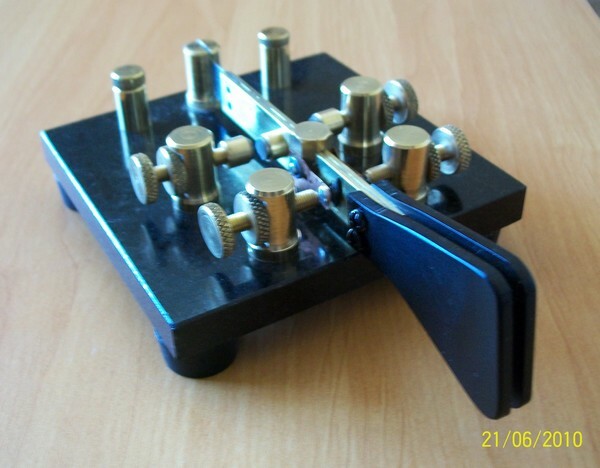 During my sea days I always used a hacksaw blade to send all my TFC etc was much easier than the Marconi 365B that was on stand by. [G0GSY]. I always wanted to try a magnetic cootie and now I have one! thanks to Norman and his very handy metal lathe. We decided on the old idea like the Bunnell sideswiper with a little input from myself. The base is made of Granite polished all the other parts are brass. Knurled screws and pillars made on the lathe and the handle is made from Bakelite. The contacts are from an electrical relay we found at a Radio Rally and work very well giving the feel a very nice soft touch, we are still experimenting on the contacts and so far seem ok. Takes a bit of getting used to after using a flexi blade for so long, the magnetic side of things are great! and this key can also make the famous cricket sound, I'm sure this key is going to work very well once I have mastered it. [G0GSY]. Page updated on June 22, 2010.